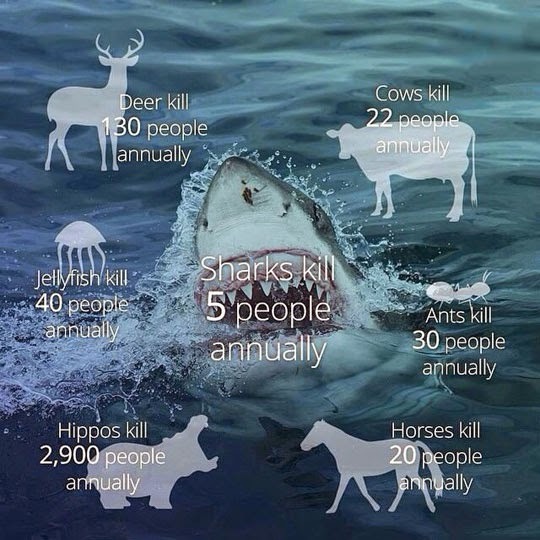 Be honest; you thought sharks were a bigger risk than horses or ants, didn't you? It just goes to show how bad we we can be at estimating risk. I don't always appreciate infographics, but this one at least is pretty straight forward and uncluttered. "In the United States, dogs, snakes, bees and pigs each kill more people per year (.pdf) than sharks. In fact, dogs kill more humans than any animal except for other humans. Sharks are more dangerous than dogs, yes, but we're far more likely to encounter dogs than sharks."